Ok, I cannot take credit for that awesome name. 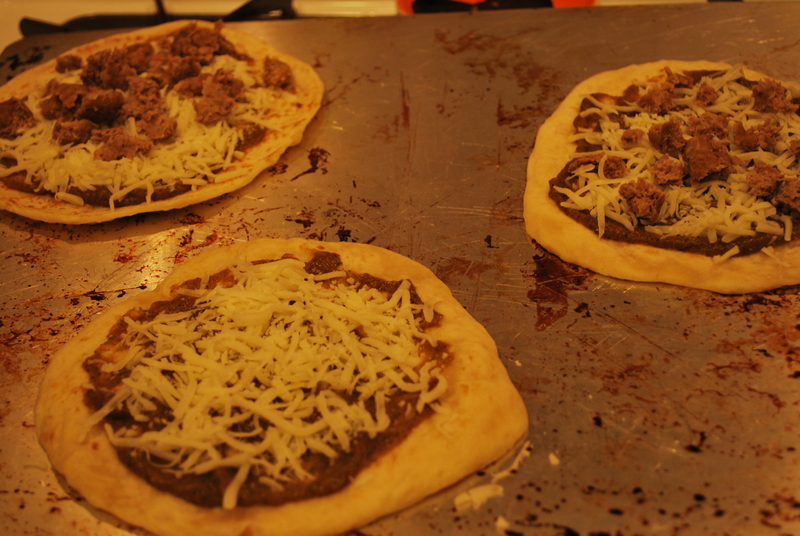 I was just making quick weeknight pizzas on tortillas. Boringly, I just called them…ready? 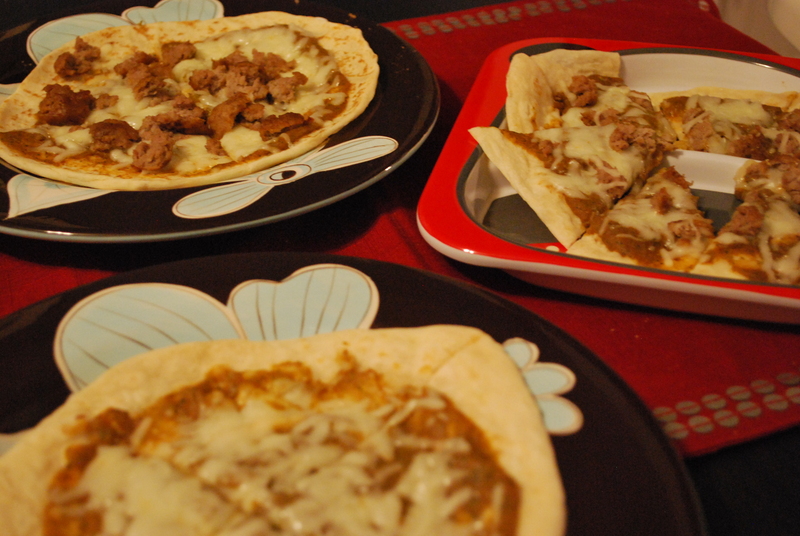 Pizzas on tortillas. I know, I’m brilliant. But I just showed some pictures of Olivia eating these wondrous pizzas and a friend said they had teased a coworker for doing the same thing…and they called it his Quesadizzas. So, that’s what we’ll call it. I suppose we could say Pizzatillas or Pizzadillas? Hmm? I’ll have to ponder that. If you have a preference, comment and let me know this crazily important life decision. This is one of those dinners that you can whip up in no time flat, especially if you’ve made the sauce in advance like we did. We just keep our pizza sauce in the refrigerator for when we need it. No pizza dough? No problem! We have some tortillas here so we are making little pizzas for our meal. Some bonuses about making dinner this way? It’s quick, like I mentioned. It’s portion control built-in. Everyone gets their own mini-pizza. And the biggest bonus? We always have some sort of vegetable on hand, so we simply pureed it into our sauce so now our pizza sauce always has some added veggie nutrients. We simply topped our tortillas with our veggie pizza sauce and some mozzarella and whatever toppings we were in the mood for. In no time flat, some delicious pizzas. We love this recipe for those days you need to whip up something nutritious with little time free. In a large skillet, melt the butter. Add the onion and garlic to the butter (by the way, best smell ever, am I right? Onions and/or garlic sauteeing in butter? Heaven!) and saute until everything is soft and translucent. Then, add the tomato sauce and tomato paste and stir everything until it is smooth. Add the remaining ingredients and bring it to a simmer. At this point, technically, it is done. But I like the flavors to develop a bit more, so if you have the time, I would really recommend simmering the pizza sauce for at least 30-60 minutes, depending on how much time you have and how developed you like your flavors. And there you have it. Pizza sauce. At this point, you could add in some cooked up vegetables and throw it all in the Vitamix/blender to add in some extra veggies. We had some broccoli & cauliflower, so that’s what we added to our pizza sauce. It made it look unappetizingly green-ish red, but it tasted delicious! Preheat the oven to 375. Spoon some of your pizza sauce onto your tortillas. Top it off with the shredded mozzarella and toppings of your choice. Pop in the oven and in about 5-10 minutes (depending on what you topped your pizza with, how ooey gooey you want your cheese, etc. ), you’ll have your Pizzadilla/Quesadizza. Quick, Easy, Nutritious, Fun to Say, and, most importantly, Tastes Oh-So-Good.